Last week’s blog, explored using innovation to impact schools, teaching, and learning. I mentioned that being focused only on improvements can block transformational change and that leaders will like have difficulties to address in a school open to innovation. transformation – a thorough or dramatic change in form or appearance. – A process whereby we move over time to reformulate our structures for making meaning, usually through reconstructing dominant narratives or stories. This provides us with a more dependable way to make meaning within our lives, since we are questioning our own points of view, looking and reflecting on alternate points of view and often creating a new, more reliable and meaningful way of knowing that may be different from our old habits of the mind. This requires us to become open to others points of view, and to be able to reflect on new points of view and information and often go back and reconstruct what we know and how we know it. So last week’s blog mentioned innovation in terms of technology, professional learning, and closing the achievement gap for struggling students. What might be the pictures or stories if transformation occurred in these areas? In a blog, Anatomy of a 21st Century Classroom, Med Kharbach identifies what we would want to see students doing in school to produce desired learning outcomes. Would your school need transformation for this to occur? Select appropriate digital tools to assemble, evaluate, and utilize information. Use information and resources to accomplish real-world tasks. Use technology to collaborate and solve authentic problems. Initiate communication in real and non- real time. Apply critical thinking and research methods and communication tools to create original work. When several members of the Learningforward Foundation Board were discussing systems of transformational professional development, I asked them what they would see if it were happening. Here are some of the words they used. How different is this from what your staffs are experiencing? 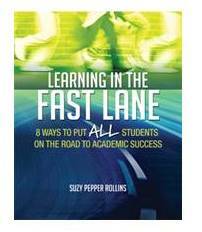 In Learning in the Fast Lane, Suzy Pepper Rollins identifies how in most remedial programs, students are asked to go back and master everything they missed before they can learn the current grade level material. While the rest of the class has moved further ahead, this student has often fallen further behind. By using an accelerated approach rather than a remedial approach, students with learning gaps are jump-started into learning new concepts ahead of their classmates. Students are prepared to learn the new material with their classmates. Past concepts and skills are addressed in purposeful context of future learning. Would transformation of a system be needed for underperforming students to be accelerated rather than remediated? In what ways do you see your leadership and coaching promoting innovation and creating transformation? As a Capacity Building Leader working with Priority School(bottom 5%)I see your point on innovation blocking transformation taking place. The additional resources you have referenced are very beneficial as I contiue to reflect on supporting the work of these struggling schools.